I think i may wait until tax rebate time to get me one. Can't wait for your review though. This is merely a modern affectation, started by those upper-crusties who don't wish to be linguistically associated with the pleb's who don't own Roll Royce motor cariages. 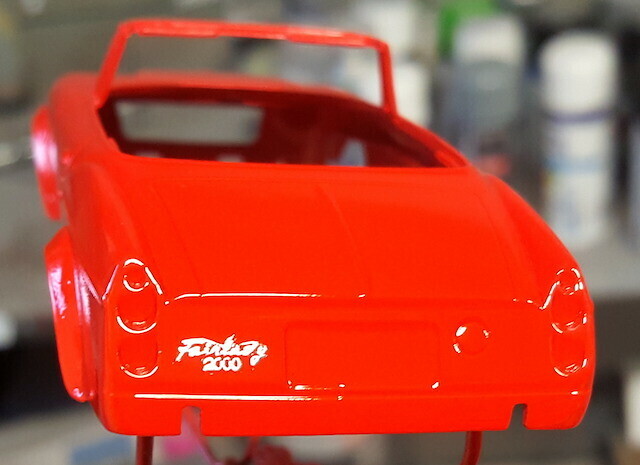 This morning before work I polished the paint off the foiled scripts on the (now red) Datsun. I cleared the Datsun today. Looks good if I do say so myself. Nice and shiny (which isn't always the case with my airbrushing). Cooo, that's BRIGHT! But looks great. What foil do you use to cover the scripts and badges etc. please? And how far around the scripts do overlay the foil? Thanks folks. Thats Zero Paints clear over a Zero Paints colour called "Bright Red (similar to TS49)". I use Bare Metal Foil and I trim it back as close to the edge of the scripts as I can. Having now got a full sheet of it, and used less than 2 sq. ins on the Caterham, I'll try that on my daughter's Mustang. Thank you kindly. I put the foil on the scripts between the primer (or undercoat if I use one - depends on the colour) and the colour coat. If I put on a clear coat then I polish the paint off the foil and clear over the top. Polish gently with a cotton bud. Don't press too hard or you risk pulling the foil off. 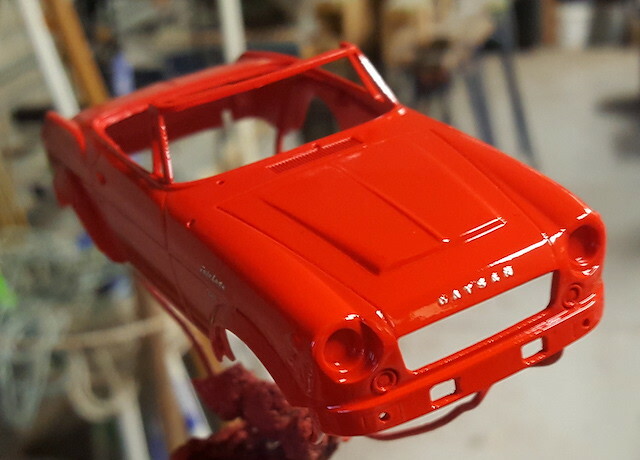 I favour metal polish for removing the paint - a paste one rather than a liquid. 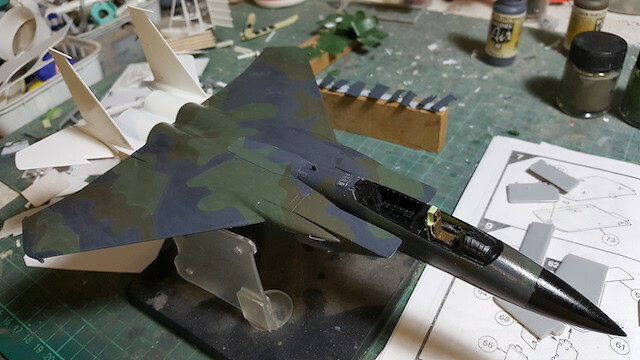 F-15 is now cleared and i've been painting the fiddly bits. I need to find where I put some RAAF low viz kangaroos I printed off a while ago. On the Royce Armoured Car i'm getting all the smaller body parts ready for paint (mudguards, running boards etc). Cessna floats are painted and are waiting for decals. ...it has crossed my mind to try submerging it and filling it with water to try and wash the dust out. However, i've been using PPP so that may end in disaster. maybe i'll just ignore it and then chose my photos carefully. I've made a note of your 'scripting' technique, thanks. I will happily share in the plaudits of your successes and deny any responsibility for your failures. It's ready for the stickers and painting of the legs, wheels, exhausts and canopy. And i need to finish painting the pilot.